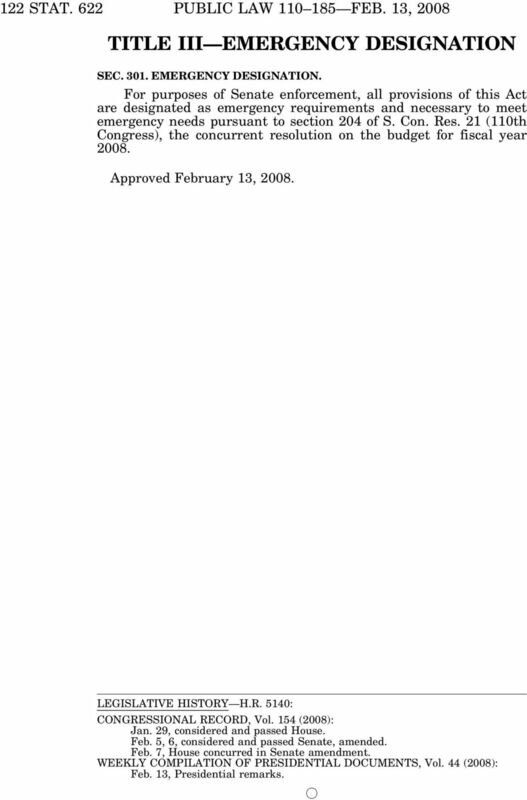 Download "PUBLIC LAW 110 185 FEB. 13, 2008"
115 STAT. 2427 Public Law 107 134 107th Congress An Act To amend the Internal Revenue Code of 1986 to provide tax relief for victims of the terrorist attacks against the United States, and for other purposes. S. ll. 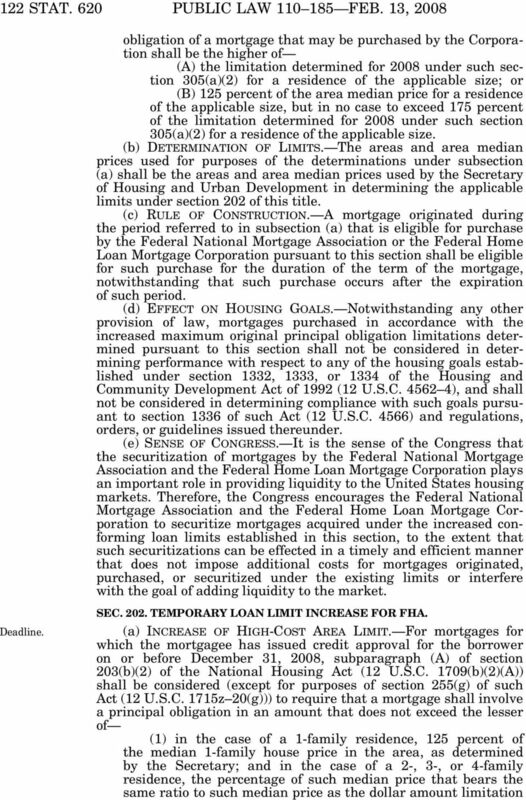 To amend the Higher Education Act of 1965 to provide for the refinancing of certain Federal student loans, and for other purposes. POST-9/11 VETERANS EDUCATIONAL ASSISTANCE IMPROVEMENTS ACT OF 2010 VerDate Mar 15 2010 02:21 Feb 09, 2011 Jkt 099139 PO 00377 Frm 00001 Fmt 6579 Sfmt 6579 E:\PUBLAW\PUBL377.111 GPO1 PsN: PUBL377 124 STAT. S. 3432. To establish a temporary Working Capital Express loan guarantee program for small business concerns, and for other purposes. 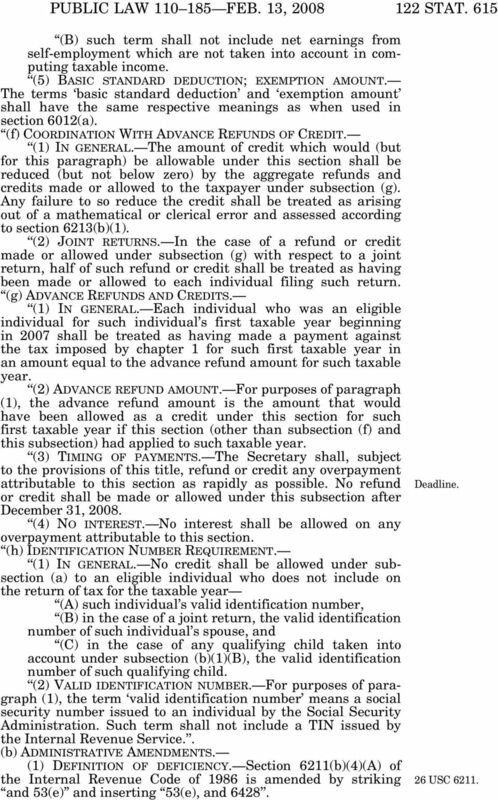 CHILDREN S HEALTH INSURANCE PROGRAM REAUTHORIZATION ACT OF 2009 VerDate Nov 24 2008 10:41 Feb 17, 2009 Jkt 079139 PO 00000 Frm 00001 Fmt 6579 Sfmt 6579 E:\PUBLAW\PUBL003.111 GPO1 PsN: PUBL003 123 STAT. II TH CONGRESS 1ST SESSION S. 1 To amend the Higher Education Act of 1 to establish fair and consistent eligibility requirements for graduate medical schools operating outside the United States and Canada. 122 STAT. 3478 PUBLIC LAW 110 315 AUG. 14, 2008 (E) MINORITY BUSINESS. The term minority business includes HUBZone small business concerns (as defined in section 3(p) of the Small Business Act (15 U.S.C. 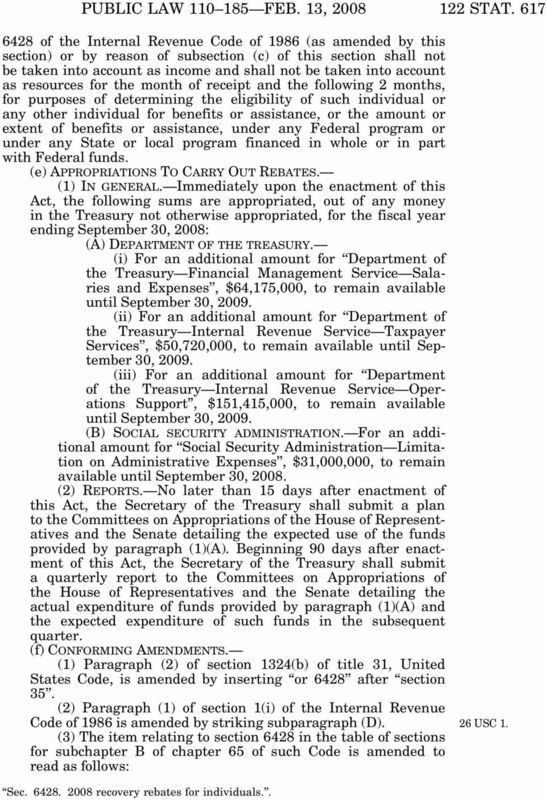 Economic Stimulus Act of 2008 H.R. 5140. 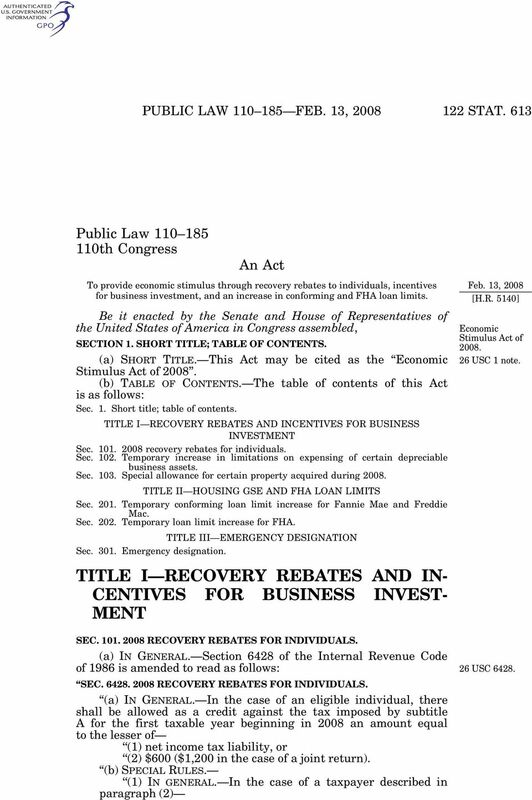 Passed by both the House and Senate on February 7, 2008, the Economic Stimulus Act of 2008 provides rebates for individuals and incentives for business investment. S. 2994. 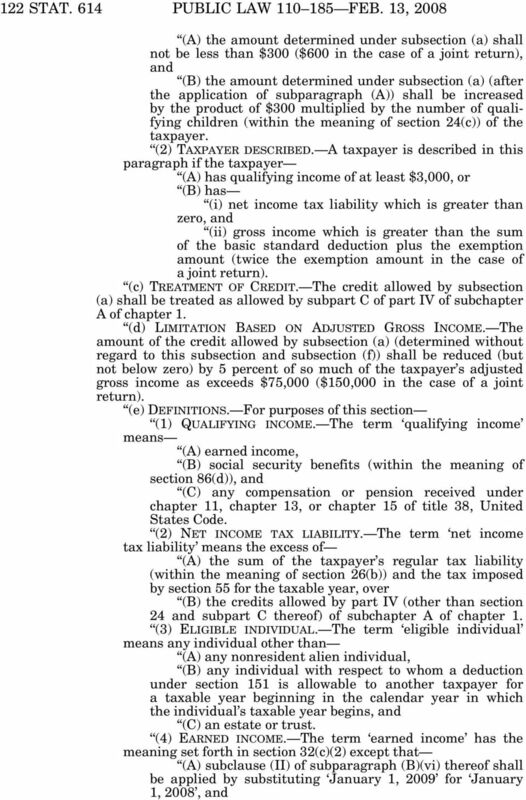 To amend the Internal Revenue Code of 1986 to provide tax incentives to encourage small business health plans, and for other purposes. 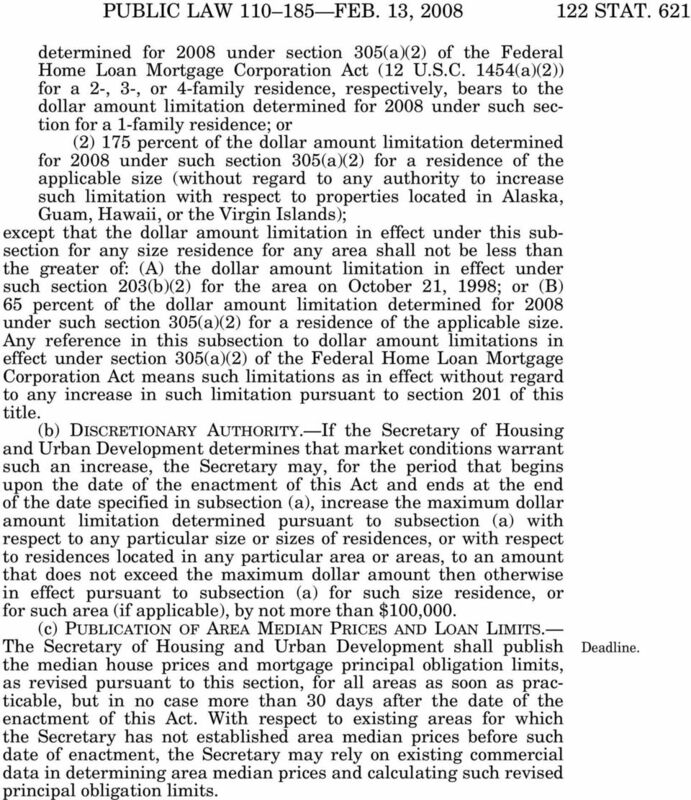 H. R. 1171. To amend the Internal Revenue Code of 1986 to provide recruitment and retention incentives for volunteer emergency service workers. PUBLIC LAW 109 2 FEB. 18, 2005 CLASS ACTION FAIRNESS ACT OF 2005 VerDate 14-DEC-2004 04:23 Mar 05, 2005 Jkt 039139 PO 00002 Frm 00001 Fmt 6579 Sfmt 6579 E:\PUBLAW\PUBL002.109 BILLW PsN: PUBL002 119 STAT. H. R. ll. 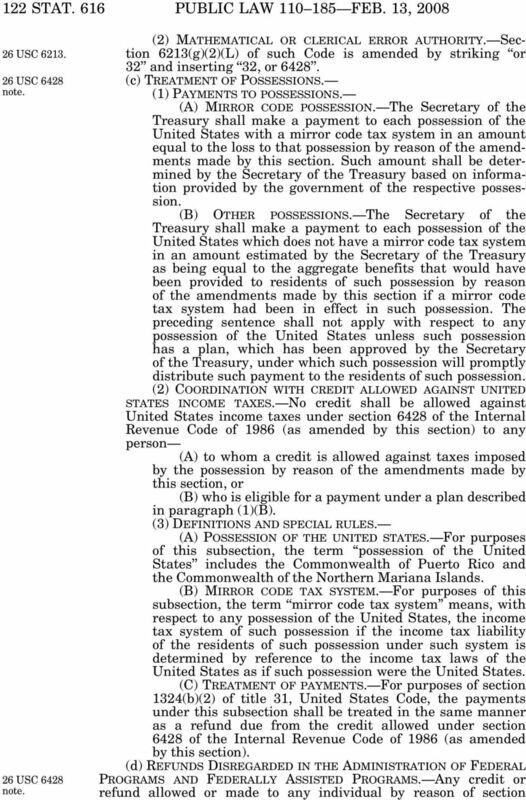 To amend the Internal Revenue Code of 1986 to provide for the proper tax treatment of personal service income earned in pass-thru entities. wwoods2 on DSK1DXX6B1PROD with CFR Food and Nutrition Service, USDA 240.1 in the case and will not be subject to reconsideration. (Sec. 14, Pub. L. 95 166, 91 Stat. 1338 (42 U.S.C. 1776); sec. 7, Pub. Economic Stimulus Package of 2008 February 9, 2008 Feed address for Podcast subscription: http://feeds.feedburner.com/edzollarstaxupdate Home page for Podcast: http://ezollars.libsyn.com 2008 Edward K.
H. R. ll. To amend the Federal Employees Compensation Act. IN THE HOUSE OF REPRESENTATIVES A BILL. 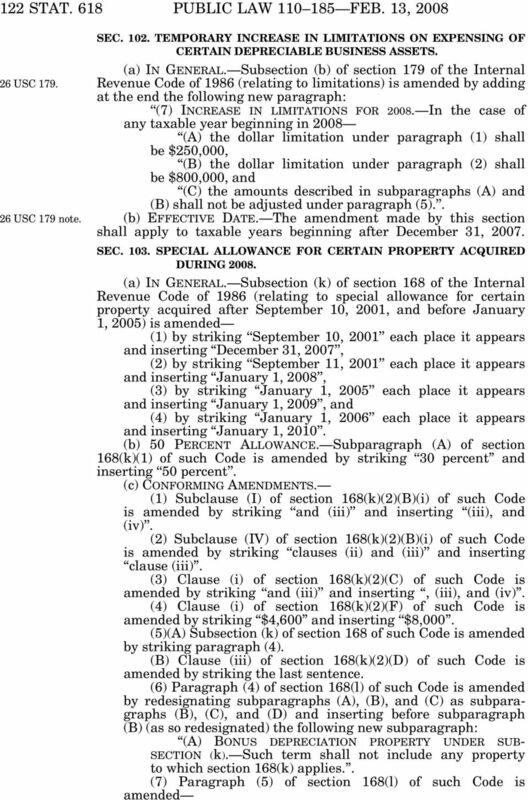 To amend the Federal Employees Compensation Act. 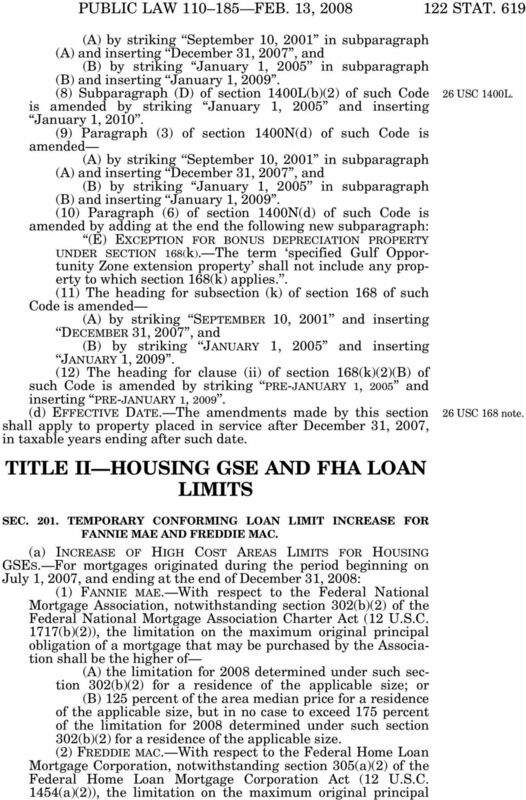 F:\AS\EW\FECA\FECA_INT.XML TH CONGRESS ST SESSION... (Original Signature of Member) H. R. ll To amend the Federal Employees Compensation Act. IN THE HOUSE OF REPRESENTATIVES Mr. KLINE (for himself, Mr.